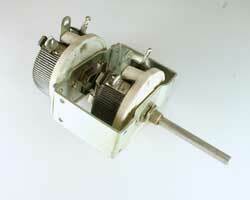 Rheostat is an adjustable or variable resistor. 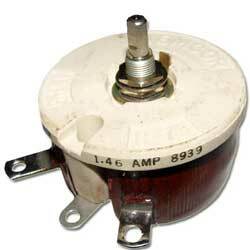 It is used to control the electrical resistance of a circuit without interrupting the flow of current. Rheostat has 3 terminals and usually consist of a resistive wire wrapped to form a toroid coil with a wiper that slides along the surface of the coil. It is most often designed with a ceramic core. 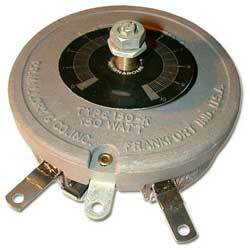 Rheostats are used in applications that require high voltage and current. As a result of the reduction of size and power consumption in many of today’s electrical devices rheostats, once are very common item in commercial and industrial products, have been replaced by potentiometers. However there are still many applications that require a device that can be used to handle significant power and for these applications a rheostat is a very good choice. The most common uses today for rheostats are as light dimmers and motor speed controls. 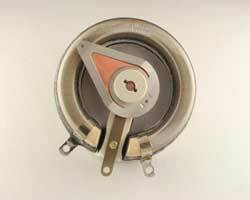 They are often used in arc lamps, pumps, fans and blowers, respirators, dental and medical equipment and model trains. When selecting a rheostat for a particular application, current is usually a more important factor than the wattage rating. If you are using a rheostat for motor control it is important to know that all types of direct current motors can be speed-controlled, however, only a few kinds of alternating current motors are controllable therefore, it is essential to obtain the correct type of AC motor when speed control is required. 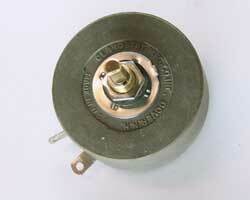 Most rheostats have either a round or flat shaft that allows you to attach a knob to the rheostat. 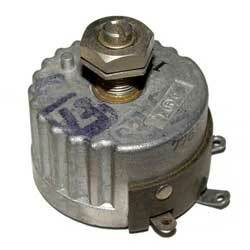 Some of the smaller sizes have screw-driver slots that allow you to adjust the rheostat. 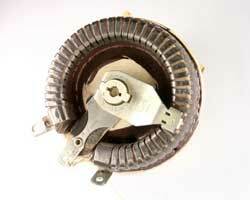 Switches can be attached to a rheostat in order to open the rheostat circuit or to access an independent circuit. Rheostats can be supplied with a fixed or an adjustable stop limiting the angle rotation to any desired part of the total possible rotation. Generally this style of rheostat is used in applications where it is desired to leave a certain amount of resistance in the circuit at all times. Click here to browse rheostats in our inventory.